Ada Lovelace. Grace Hopper. Elizabeth “Jake” Feinler. Stacy Horn. Raise your hand if you know who any of these women are. Now raise both hands if you know who at least two of them are. Now wave your hands around. I kid, I kid. In all seriousness, I’ve been using the Internet since the mid-90s, brought into the world of technology as a young child. I’ve grown up with the Internet. From the days of signing into the computer program AOL, digging into AIM and chat rooms and Neopets.com, through the digital ages and into the barrage of social media (Twitter, Facebook, Instagram, Pinterest, oh my) we have today – I’ve barely known a world without the Internet. Yet never have I stopped to think about how the Internet came to be, or how it came to where it is today. Before we can think about where technology is going, isn’t it important to know where it’s been? 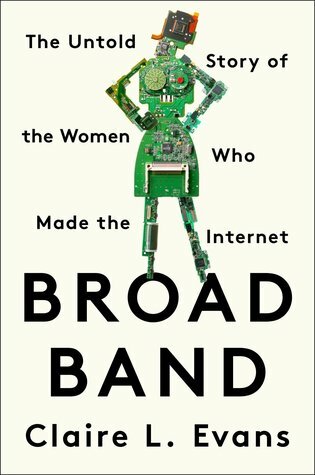 And isn’t it important to consider who got us here – in this case, a host of incredible women who paved the way for the Internet as we know it? I won’t like, for someone who doesn’t work in tech, this book sometimes got a little bogged-down for me, with names of things I didn’t quite understand. But overall, it told a captivating story, and really made me appreciate the Internet and technology as it is today even more. It also made me proud, of just how big an impact women can have and have had, from early chat rooms and zines to creating the very fabric of the Internet. It’s also important to me that I point out that author Claire L. Evans doesn’t shy away from the hard topics in this book. She discusses the effects of gender on technology and engineering, but also discusses the effects of class, and race to an extent. She discusses cyberfeminism and capitalism and the patriarchy. The more diversity there is at the table, the more interesting the result onscreen, the more human, as Stacy Horn would say, bite me, the better. There’s no right kind of engineer, no special plane of thought that must be reached to make a worthwhile contribution. There’s no right education, no right career path. Sometimes there isn’t even a plan. The Internet is made of people, as it was made for people, and it does what we tell it to do. We can remake the world.